Excavate a pond up to 18 feet deep with dimensions of 1,700lf x 300lf at the widest point. Pond is a new habitat for Mudpuppies, an aquatic salamander. Using conventional dewatering with wellpoints or deep wells, the project would have required up to 10 diesel pumps running simultaneously for the wellpoints. The Operating Engineers claimed the operations and maintenance costs required to run wellpoints 24 hours a day, 7 days per week would be astronomical. Similarly, if diesel generators were provided for the deep wells, there would be high operations and maintenance costs with Operating Engineers 24/7. The systems would be running for 6-7 months and each set of operators would be around $30K. There would be at least 3 sets. Griffin installed horizontal wells using a one-pass trencher to a depth of 18’ below ground surface (bgs). Each line ran from one end of the pond to the other. A total of 11,000 feet of sock-tile was installed. The sock-tiles were trenched to two locations where Vacuum Well Stations were installed. Each well location had three individual wells installed to a depth of 19 feet bgs. The tiles were cut in half and the north run was connected to the well on the north side and the south tile was connected to the south end of the well. Two pneumatic ball plugs were installed in the tile mid-point in the runs of tile, where the wells were located. The plugs were needed to stop the flow of water from the tiles, so the connections could be made. The well stations needed to be temporarily dewatered with wellpoint systems surrounding the well stations. Griffin did the excavations, connection of the tiles and backfilled the excavations. Altogether there were six well stations and six runs of tile. Inside each well a 3” 2.5 Horsepower submersible pump was installed with a second pump installed with float controls in case of pump failure. 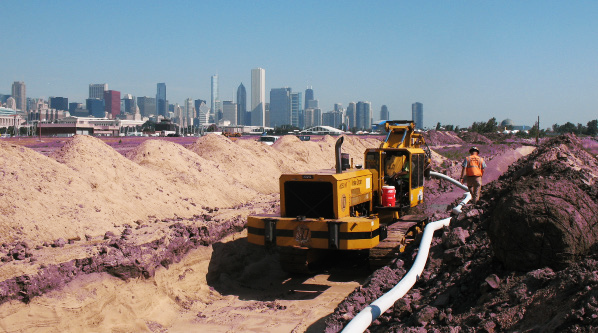 The horizontal wells and vacuum pump stations were the ideal solution for the job. No header pipe going around the site, lower horsepower required, along with all electric and no diesel fuel required resulted in lower costs. By eliminating the need for operating engineers, the Contractor savings were significant.